A dynamic and multifaceted entertaining area, this kitchen is the center for family gatherings and its open floor plan is conducive to entertaining. 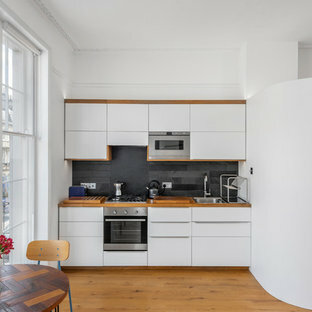 The kitchen was designed to accomodate two cooks, and the small island is the perfect place for food preparation while family and guests interact with the host. The informal dining area was enlarged to create a functional eating area, and the space now incorporates a sliding French door that provides easy access to the new rear deck. Skylights that change color on demand to diminish strong, unwanted sunlight were also incorporated in the revamped dining area. A peninsula area located off of the main kitchen and dining room creates a great space for additional entertaining and storage. 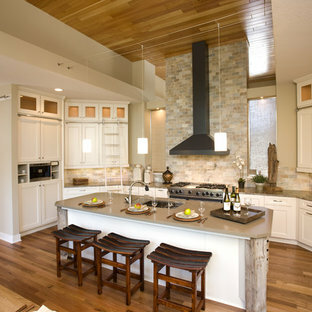 Character cherry cabinetry, tiger wood hardwood flooring, and dry stack running bond slate backsplash make bold statements within the space. 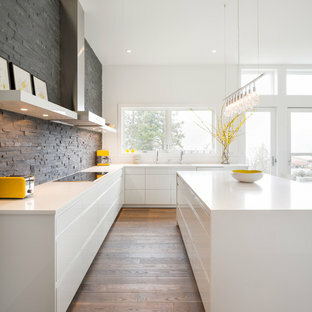 The island top is a 3" thick Brazilian cherry end grain top, and the brushed black ash granite countertops elsewhere in the kitchen create a beautiful contrast against the cabinetry. A buffet area was incorporated into the adjoining family room to create a flow from space to space and to provide additional storage and a dry bar. Here the character cherry was maintained in the center part of the cabinetry and is flanked by a knotty maple to add more visual interest. 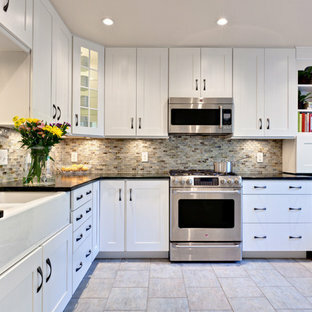 The center backsplash is an onyx slate set in a basketweave pattern which is juxtaposed by cherry bead board on either side. 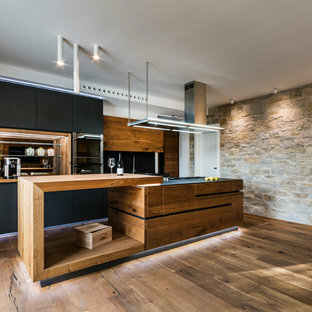 The use of a variety of natural materials lends itself to the rustic style, while the cabinetry style, decorative light fixtures, and open layout provide the space with a contemporary twist. 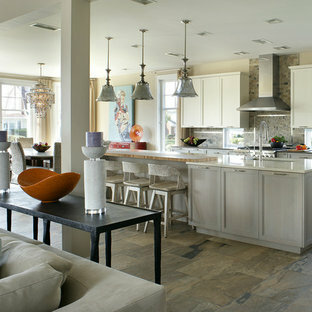 Here bold statements blend with subtle details to create a warm, welcoming, and eclectic space. 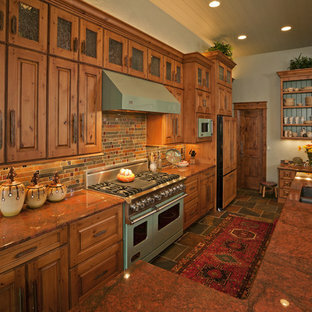 Rustic kitchen cabinets with green Viking appliances. 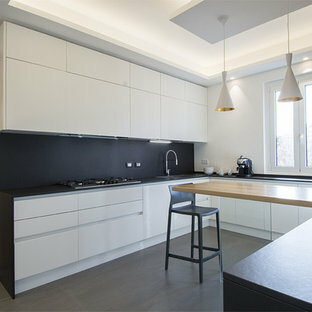 Cabinets were built by Fedewa Custom Works. 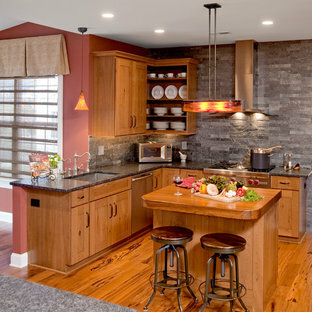 Warm, sunset colors make this kitchen very inviting. Steamboat Springs, Colorado. 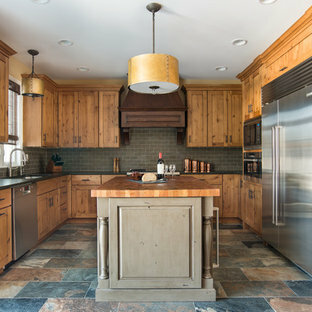 The cabinets are knotty alder wood, with a stain and glaze we developed here in our shop. 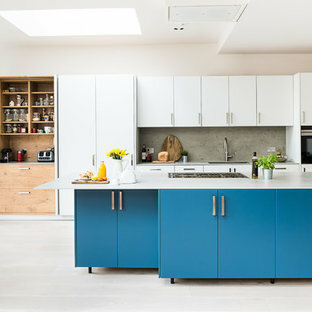 Warm wood tones and cool colors are the perfect foil to the owner's collection of blue and white ceramics. Photo by shoot2sell.